The Colts’ 46-9 loss was one of the worst games of one of the NFL’s worst weeks. Last NFL season gifted fans some of the highest scoring, most competitive football in league history, capped off by an epic Super Bowl, which saw the New England Patriots rally from a 25-point deficit. Week 1 of the 2017 season made all of that feel like a long, long time ago. 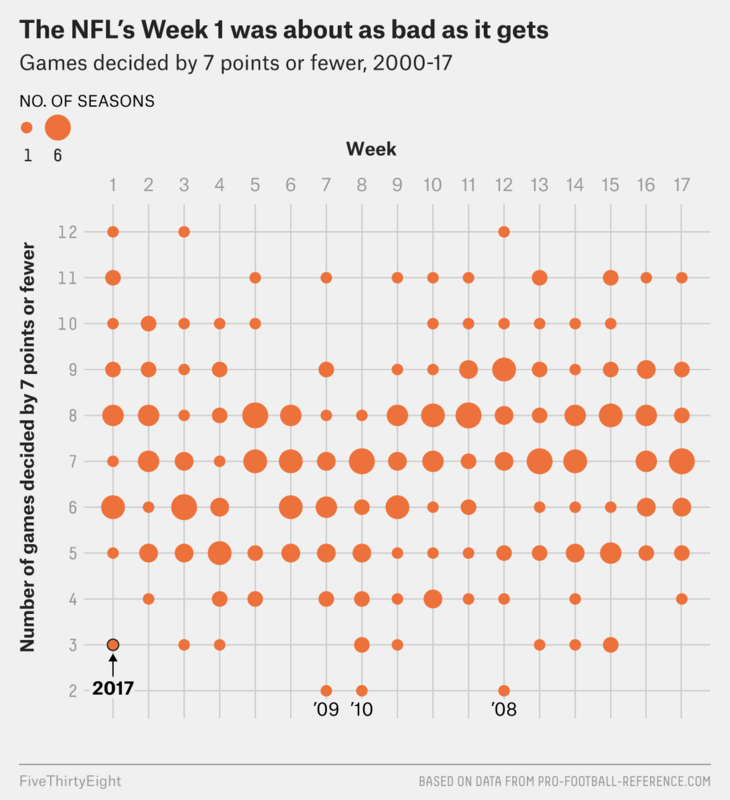 Only three Week 1 games were decided by 7 or fewer points, the lowest number for an opening week in the NFL since 1973, when one game was decided by 7 or fewer. The first week hadn’t yielded fewer than even five such games since 1976, the year before Tom Brady was born. In the 290 regular-season NFL weeks since 2000, a week with three such contests has only happened 10 times. And if not for two late fourth-quarter Los Angeles Chargers touchdowns that occurred while most of the East Coast was sound asleep Monday night,1 Week 1 of 2017 would have joined Week 7 of 2009, Week 8 of 2010 and Week 12 of 2008 as the only weeks since 2000 with a measly two games decided by 7 points or fewer. The results from the past five days are an anomaly for Week 1, which in recent years has been one of the NFL’s most competitive weeks.2 And it marks a particularly stark turn from last season, when opening week produced four 1-point games, two 2-point games and an average margin of victory of 7.6 points, the lowest of any week since Weeks 1 and 2 of 2013. In Week 1 this year, games were decided by an average of 13.6 points. Low scores and blowouts happen, but they’re rarely this pronounced at the same time. The ratio between Week 1’s average total points per game and average margin of victory was 3.0 to 1, the eighth-lowest it’s been in a week since 2012.3 Low ratios mean low-scoring games that aren’t very close, either — not exactly the hallmarks of entertaining football. The lackluster start to the season was most likely the result of a confluence of factors. Injuries to stars like the Indianapolis Colts’ Andrew Luck and the New York Giants’ Odell Beckham Jr. derailed those two offenses and helped generate boring routs. There were also some uniquely terrible performances, such as the historic stinker put up by Cincinnati Bengals quarterback Andy Dalton. And there are a couple teams — the San Francisco 49ers and New York Jets — that appear to have checked out before even starting their 2017 campaigns. That the most exciting football of the NFL’s first “weekend” came after midnight on Tuesday for many Americans speaks to how awful things were in Week 1. Here’s hoping they get back to normal in Week 2. The Chargers’ opponent, the Denver Broncos, blocked what would have been a game-tying field goal in the final seconds to win 24-21. From 2000 to 2016, Week 1’s average margin of victory was 10.8 points, second-lowest behind Week 9. Headed into Monday night, the ratio was 2.7 to 1, which would have been the second-lowest since 2012.